We at Green Mobile Repair try to keep our costs down for our customers. So to start us off – here are our top 6 FREE APPS – for offline use. This game is an oldie, but it’s so fun that it’s worth revisiting. 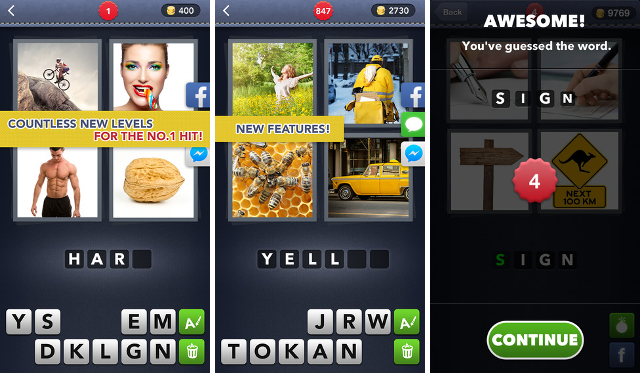 4 Pics 1 Word is simple and straightforward: you’re presented with a collection of four pictures and your goal is to guess the one word that they all have in common. It starts off pretty easy but eventually gets pretty difficult. With several hundred puzzles to solve, it’ll keep you occupied for quite a long time. Duet is a beautifully simple and elegant game. It’s one of those games you can play with only one hand if necessary. Basically, you control a blue ball and a red ball, but they’re synchronized — so by moving one, you also move the other. Your goal is to dodge obstacles and keep both balls alive. One collision is all it takes to go splat. If you’ve ever played the Pandemic flash game, then you’ll love Plague Inc. The concept is the same: your goal is to spread the plague, infect the world, and bring humanity to an end. It sounds like it’d be easy, but this is a strategy game at its core — not so difficult that you’ll want to give up, but it definitely offers enough of a challenge to keep you playing. If you’ve never played Pixel Dungeon, then you’ve been missing out. It’s probably the best introduction to the roguelikes on Android genre. In short, it’s a lightweight RPG with randomly generated levels, items, and monsters. This means that no two playthroughs are ever the same. It’s unique every time, so it’ll be a long time before you get bored of playing this one. You may know to Unblock Me by its real-life name, Rush Hour. The setup is simple: you have a 6×6 grid of blocks that can only move in the direction of their length. Your goal is to get the red block out of the grid. It’s a puzzle game, obviously, and it’s harder than you might expect — but in a fun way. It really pushes you to think outside of the box, and each victory is quite satisfying. Doodle Jump is a never-ending vertical jumper. In contrast to a lot of popular endless runner games, Doodle Jump feels less frantic and chaotic. Instead, it’s immensely fun and addictive. Your goal is to climb each level as high as you can go. Just make sure you don’t fall or collide with any enemies. There are lots of unique obstacles that pose a challenge, but also many powerups to help you out. Some of you would prefer to pay for perfection… So here are some games we have messed around with and gotten hooked on! 80 Days isn’t a traditional game. Instead, it plays more like an interactive story — but it doesn’t fall under the category of traditional interactive fiction, either. All you have to know is that it’s good. Not many people have played it, but those who have loved it. 80 Days is an experience and one that’s well worth the price tag. Thomas Was Alone is a game for the history books, at least as far as indie game development culture is concerned. Not only does it try something new and succeed at it, but it reminds us that video games can be art. Simply put, Thomas Was Alone is excellent. The price tag is a steal for a game like this. Looking for a tough game that doesn’t treat you like a child? Super Hexagon is that game. It’s really simple but really hard — in fact, it’s one of the hardest games available today. The average player loses their first game in 3 seconds, apparently. Playing this made me cry. What’s great about Super Hexagon is that it’s hard but it’s fair. Every loss is your fault, and that just makes you want to try again. With enough practice, everyone can eventually beat this game (assuming they don’t give up first). The Bloons series started as a Flash game in 2007 that exploded in popularity and eventually led to one of the most popular tower defense games on the planet, Bloons TD 5. Precious few games can rival the sheer amount of fun that this game offers. Stealing from a bank is easy, but getting away? That’s the hard part. That’s what Reckless Getaway is all about. With a trunk full of cash and a horde of police cars on your trail, your goal is to weave through traffic and make a successful escape. The controls for this game are slightly clunky and some deaths may be intensely frustrating, but it’s a lot of fun overall. Sorcery! 3 is the third instalment in the Sorcery! epic fantasy adventure series. Don’t worry, you can play Sorcery! 3 without having played the first two, but if you’re a completionist: Sorcery! (Android, iOS) and Sorcery! 2 (Android, iOS). This series is a healthy mix of exploration, combat, and storytelling. If you’re a fan of fantasy, you owe it to yourself to give it a try. Which offline games do you like? What games are your favourites? Let us know on our Facebook Page and get 20% of our merchandise (phone accessories, etc).